Beecroft railway station in Sydney, Australia, is an island-platform station in the middle of a reverse curve. This platform is accessed by a subway. An island platform (also center platform, centre platform) is a station layout arrangement where a single platform is positioned between two tracks within a railway station, tram stop or transitway interchange. Island platforms are popular on twin-track routes due to pragmatic and cost-effective reasons. They are also useful within larger stations where local and express services for the same direction of travel can be provided from opposite sides of the same platform thereby simplifying transfers between the two tracks. An alternative arrangement is to position side platforms on either side of the tracks. The historical use of island platforms depends greatly upon the location. In the United Kingdom the use of island platforms is relatively common when the railway line is in a cutting or raised on an embankment, as this makes it easier to provide access to the platform without walking across the tracks. Island platforms are necessary for any station with many through platforms. Building small two-track stations with a single island platform instead of two side platforms does have advantages. Island platforms allow facilities such as shops, toilets and waiting rooms to be shared between both tracks rather than being duplicated or present only on one side. An island platform makes it easier for wheelchair users and other people with physical limitations to change services between tracks or access facilities. If the tracks are above or below the entrance level, an island platform layout requires only one staircase and (if disabled accessibility is necessary) one elevator be built to access the platforms. Building the tracks and entrance at the same level creates a disadvantage; a side platform arrangement allows one platform to be adjacent to the entrance, whereas an island platform requires a bridge or subway to access both tracks. If an island platform is not wide enough to cope with passenger numbers, overcrowding can be a problem. Examples of stations where a narrow island platform has caused safety issues include Clapham Common (see image) and Angel (now rebuilt) on the London Underground (as well as Union (now rebuilt) on the Toronto subway and Umeda on the Osaka Municipal Subway). An island platform requires the tracks to diverge around the center platform, and extra width is required along the right-of-way on each approach to the station, especially on high-speed lines. Track centers vary for rail systems throughout the world but are normally 3 to 5 meters (10 to 16 ft). If the island platform is 6 meters (20 ft) wide, the tracks must slew out by the same distance. While this requirement is not a problem on a new line under construction, it makes building a new station on an existing line impossible without altering the tracks. A single island platform also makes it quite difficult to have through tracks (used by trains that do not stop at that station), which are usually between the local tracks (where the island would be). A rarer layout, present at Mets-Willets Point on the IRT Flushing Line, 34th Street – Penn Station on the IRT Seventh Avenue Line and 34th Street – Penn Station on the IND Eighth Avenue Line of the New York City Subway, uses two side platforms for local services with an island in between for express services. The purpose of this atypical design was to reduce unnecessary passenger congestion at a station with a high volume of passengers. Since the IRT Seventh Avenue Line and IND Eighth Avenue Line have adjacent express stations at 42nd Street, passengers can make their transfers from local to express trains there, leaving more space available for passengers utilizing intercity rail at Pennsylvania Station. The Willets Point Boulevard station was renovated to accommodate the high volume of passengers coming to the 1939 World's Fair. Many of the stations on the Great Central Railway (now almost entirely closed) were constructed in this form. 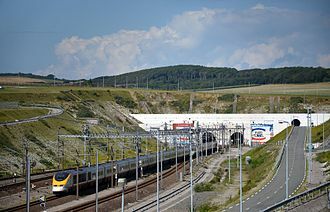 This was because the line was planned to connect to a Channel Tunnel. If this happened, the lines would need to be compatible with continental loading gauge, and this would mean it would be easy to change the line to a larger gauge, by moving the track away from the platform to allow the wider bodied continental rolling stock to pass freely while leaving the platform area untouched. Island platforms are a very normal sight on Indian railway stations. Almost all railway stations in India consist of island platforms. In Toronto, 29 subway stations use island platforms (a few in the newer stations on the Bloor–Danforth line, a few on the Yonge–University line and all of the Sheppard line). In Sydney, on the Eastern Suburbs Railway and the Epping Chatswood Railway, the twin tunnels are widely spaced and the tracks can remain at a constant track centres while still leaving room for the island platforms. A slight disadvantage is that crossovers have to be rather long. In Edmonton, all 18 LRT stations on the Capital Line and Metro Line use island platforms. The Valley Line under construction, utilizes the new low-floor LRT technology, but will only use island platforms on one of the twelve stops along the line. In southern New Jersey and Philadelphia, PATCO uses island platforms in all of its 13 stations, to facilitate one-person train operation. Most elevated stations in Singapore's Mass Rapid Transit (MRT) system use island platforms. The exception is Dover MRT Station, which uses side platforms as it is built on an existing rail line, also known as an infill station. Braddell adopts a side-platform-layout due to lack of space to the north of the tunnels. The planned Canberra MRT Station will also use side platforms, as it will also be built on an existing rail line, while Gul Circle use a stacked side platform configuration. Sometimes when the track on one side of the platform is unused by passenger trains, that side may be fenced off. Examples include Hurlstone Park and Lewisham. 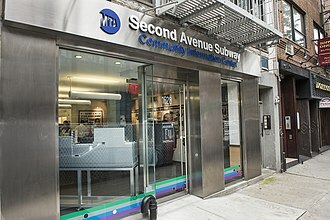 In New York City's subway system, unused sides can be found at Bowling Green as well as every express station without express service, such as Pelham Parkway. In Jersey City, the Newport PATH station has the same configuration as Bowling Green—one side platform and one island platform. On the Tokyo Metro, the Ginza Line has a side platform and an island platform at Nihombashi. Likewise, the Namba and Minami-morimachi stations on the Osaka Metro have similar configurations. Some stations of the Glasgow Subway have one island platform and one side platform (Hillhead, Buchanan Street, and Ibrox). In Wellington, New Zealand, unused sides can be found at two stations on the Hutt Valley Line: Waterloo and Petone. Waterloo's island platform was reconfigured to be the down side platform when the station was extensively rebuilt in the late 1980s, with the unused side now facing onto a bus bay. Petone's island platform served the up main line and the suburban loop line until the suburban loop was lifted in the early 1990s. The unused platform now faces onto the station's park-and-ride carpark. Ashton-under-Lyne station, an island platformed station in England. Island platform tram stop at Winson Green Outer Circle on the Midland Metro, in England. Navy Yard – Ballpark station on the Washington Metro Green Line after a baseball game at Nationals Park. Island platform at Bowling Green station in New York City with one side fenced off. Aboveground island platform at Roxbury Crossing station on Boston's Orange Line subway system. Island Platform at Grafton Station on the Western Line of Auckland's suburban rail network. Yau Ma Tei Station, an island platformed station in Hong Kong. Moody Centre station, an island platformed station in Metro Vancouver, British Columbia. Yorkdale (TTC), one of 29 station in the Toronto, Ontario system with centre platforms. Corona LRT Station is an island platformed station in Edmonton, Alberta. Gambir railway station is an island platformed railway station in Jakarta, Indonesia. 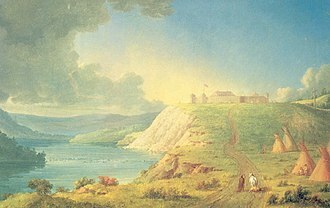 Wikimedia Commons has media related to Island platforms. The Toronto subway is a rapid transit system in Toronto, Canada, operated by the Toronto Transit Commission. It is a system consisting of three heavy rail lines operating predominantly underground and one elevated light metro line, collectively encompassing 69 stations and 68.3 kilometres of track. It accommodated an average of 1,066,100 passenger trips each weekday during the quarter of 2015. There are 4 rapid transit lines in Toronto plus another under construction, Line 1 Yonge–University, is the longest and busiest rapid transit line in the system. It opened as the Yonge subway in 1954 with a length of 7.4 kilometres, the line is U-shaped having two northern terminals looping on its southern end via Union Station. 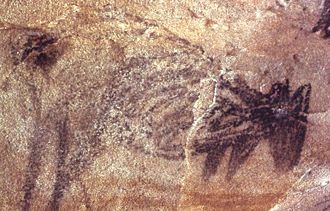 An 8. 6-kilometre, six-station extension of Line 1 north to Vaughan is under construction, Line 2 Bloor–Danforth, opened in 1966, runs parallel to Bloor Street and Danforth Avenue between Kipling Station in Etobicoke and Kennedy Station in Scarborough. There is a plan to extend Line 2 eastwards from Kennedy Station to Scarborough Town Centre, Line 3 Scarborough is an above-ground medium-capacity rail line serving the citys eponymous suburban district. The line runs from Kennedy Station to McCowan Station passing Scarborough Town Centre and this is the only rapid transit line in Toronto to use Intermediate Capacity Transit System technology. There is a plan to close and dismantle Line 3 after Line 2 is extended to Scarborough Town Centre, Line 5 Eglinton is a 19-kilometre light rail line under construction scheduled to open in 2021. The line will have 25 stations of which 15 will be underground, here is a list of line and station openings on the Toronto subway system. Canadas first subway, the Yonge subway, opened in 1954 with a length of 7.4 kilometres, the line ran under or parallel to Yonge Street between Eglinton Avenue and Union Station. It replaced the Yonge streetcar line, Canadas first streetcar line, in 1963, the line was extended under University Avenue north to Bloor Street to connect with the Bloor-Danforth subway at the double-deck St. George Station. In 1974, the line was extended from Eglinton Station north to Finch Station, the Spadina segment of the line was constructed north from St.
SEPTA manages construction projects that maintain and expand infrastructure and rolling stock. 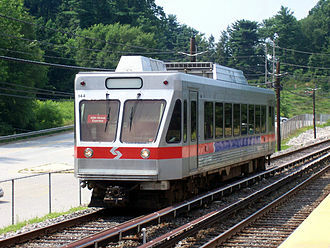 SEPTA is the transit provider for Philadelphia and its suburbs in Delaware, Bucks. SEPTA is a state created authority and the majority of its board is appointed by the five Pennsylvania counties it serves. SEPTA has the 6th-largest U. S. rapid transit system by ridership, and it controls 290 active stations, over 450 miles of track,2,295 revenue vehicles, and 196 routes. 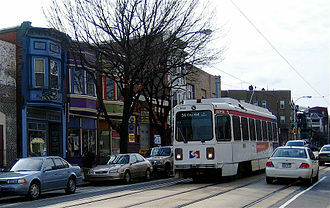 SEPTA manages Shared-Ride services in Philadelphia and ADA services across the region and these services are operated by third-party contractors. SEPTA is one of only two U. S. SEPTAs headquarters are located at 1234 Market Street in Center City, SEPTA was created by the Pennsylvania legislature on August 17,1963, to coordinate government subsidies to various transit and railroad companies in southeastern Pennsylvania. It commenced on February 18,1964, by 1966, the Reading Company and Pennsylvania Railroad commuter railroad lines were operated under contract to SEPTA. On February 1,1968, the Pennsylvania Railroad merged with the New York Central railroad to become Penn Central, Penn Central continued to operate in bankruptcy until 1976, when Conrail took over its assets along with those of several other bankrupt railroads, including the Reading Company. Conrail operated commuter services under contract to SEPTA until January 1,1983, when SEPTA took over operations and acquired track, rolling stock, and other assets to form the Railroad Division. Since 1913, a long proposed Roosevelt Boulevard Subway had a similar fate as New Yorks Second Avenue Subway where many proposals were made, many acquisitions had been made, but only amounted to continuous service cuts through consolidations of competing services of the Reading Railroad and Pennsylvania Railroad. It wasnt until the early 2000s that there was any talk of expansion, the PTC had been created in 1940 with the merger of the Philadelphia Rapid Transit Company and a group of smaller, independent transit companies operating within the city and its environs. Today, this is the Victory Division, though it is referred to as the Red Arrow Division. 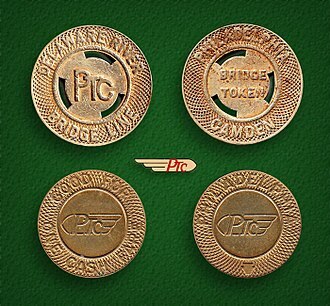 On March 1,1976, SEPTA acquired the operations of Schuylkill Valley Lines. Future expansion of SEPTAs commuter rail lines has been discussed since the mid-1980s when the system suffered severe cutbacks, proposals have been made to restore service to Allentown, West Chester and Newtown, with support from commuters, local officials and pro-train advocates. The Schuylkill Valley Metro and other plans that would re-establish service to Phoenixville, Pottsville, SEPTA has considered the possibility of a cross-county metro that would provide service between the suburban counties without requiring the rider to go into Philadelphia. However, many derelict lines under SEPTA ownership have been converted to rail trails, some, such as Senator Bob Casey, have proposed expanding the Broad Street Line to the Philadelphia Naval Shipyard. Proposals have made for increased service on existing lines, including evenings and Sundays to Wilmington. The IRT Flushing Line is a rapid transit route of the New York City Subway system, operated as part of the A Division. It carries trains of the 7 local service, as well as the express <7> during rush hours in the peak direction. It is shown in the color raspberry on station signs, the subway map, internal route maps in R188 cars. Before the line was opened all the way to Flushing, it was known as the Corona Line or Woodside, prior to the discontinuance of BMT services in 1949, the portion of the IRT Flushing Line between Times Square and Queensboro Plaza was known as the Queensboro Line. The Flushing Line has various styles of architecture, which range from steel girder elevated structures to European-style concrete viaducts, the underground stations have some unique designs as well. Services that use the Flushing Line are colored raspberry, the following services use part or all of the Flushing Line, The line has two distinct sections, split by the Queensboro Plaza station. It begins as a subway, with the center track used for express service. It quickly leaves the ground onto an elevated structure above Roosevelt Avenue, passing Citi Field. A flying junction between Mets–Willets Point and 111th Street provides access to the Corona Yard from the local tracks, at 48th Street in Sunnyside, the line switches to Queens Boulevard and an ornate concrete viaduct begins. The express track ends between 33rd Street–Rawson Street and Queensboro Plaza, at Queensboro Plaza, the eastbound track is above the westbound track, with both tracks on the south side of the island platforms. On the north side of platforms is the BMT Astoria Line. East of this point, both the Flushing Line and the Astoria Line were formerly operated by the IRT and the BMT, details on that dual operation are in the Background section. Connections still exist between the tracks just east of the platforms, but they cannot be used for revenue service because BMT trains are wider than IRT trains. This is the track connection between the Flushing Line and the rest of the subway system. Umeda Station is a railway station located in Kita-ku in the northern commercial center of Osaka, Japan. It is the busiest station in Western Japan, serving 2,343,727 passengers daily in 2005, the nearby stations Ōsaka, Nishi-Umeda and Higashi-Umeda are within walking distance and connected by a large complex of underground malls. The underground Umeda terminal of Hanshin Electric Railway is located south of Ōsaka Station, the Hanshin station first opened on December 21,1906 as a ground level station and moved to the present underground location on March 21,1939. There are five bay platforms and four tracks on the second basement, there are east ticket gates on the second basement and center ticket gates and west ticket gates on the first basement. The Umeda terminal of Hankyu Railway is located northeast of Ōsaka Station, the station first opened on March 10,1910, as a ground-level station. The original location of the station was southeast of Ōsaka Station, the station was elevated on July 5,1926. When Ōsaka Station was elevated in 1934, Hankyus elevated tracks were forced to be removed, the switching of tracks were carried out on June 1,1934. This station facility was used until November 28,1971, when the move of station to the present location was completed and this move was because of a sharp increase of transit, which forced Hankyu to operate 8-car trains. 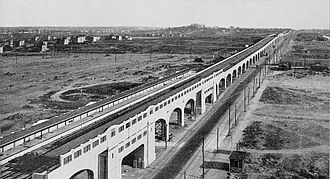 The existence of JNR tracks on the end of the 1934 station prevented the expansion of the station so that the station could not handle long trains. After the opening of the current huge elevated station, spaces around and beneath the station, one of the symbols of the commercial complex surrounding the station is the BIG MAN video screen above the Kinokuniya bookshop and necessary places to meet in this bustling railway station. The Hankyu Department Store, built next to the station in 1929, was a pioneer of the business model of department stores run by urban railway companies in Japan. The store is still in business at the location even after the move of the station. The 13 km line is completely underground and includes three new intermediate stations, North Ryde, Macquarie Park and Macquarie University. The junction stations at Epping and Chatswood both underwent major redevelopments to incorporate the new link, when voters in neighbouring Eastwood complained, the line was proposed to link south of Eastwood, use island platforms at Eastwood and link to Epping. In 1929, local estate agents promoted land sales along the railway line at Epping in preparation for the construction of the line. They called the area Epping Junction, on account of the station being a junction between the Epping-St Leonards Line and the Main Northern Line, a new island platform was built in preparation for the terminus of the new line. 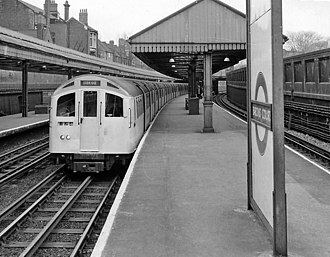 The track was to be in the middle of the two Main Northern Line platforms, and until the 1970s still existed as a terminating line, in its place, a road was built between St Leonards and Epping, which is the current Epping Road. 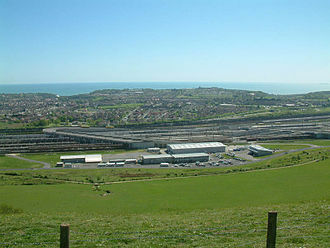 The land sales were a failure, and the lots around the railway were not sold until the 1950s and 1960s. It was not until the 1990s that plans for the line were resurrected, an original proposal to run from Westmead to St Leonards, via Epping was considered, but in 1998 the Parramatta Rail Link was announced as part of the NSW Governments Action for Transport 2010 plan. The line was to run from Chatswood through Epping to Parramatta and this proposal included optional stations at Delhi Road and UTS Kuring-gai and would be served by eight services an hour. Construction was planned to commence in late 1999, with the line to open in 2006, construction of the PRL began with the Chatswood to Epping section, which commenced in November 2002. In August 2003 the NSW Transport Minister, Michael Costa, announced that the Epping-Parramatta section would be postponed indefinitely. The delaying of this section was justified on the grounds that the daily patronage of 15,000 passenger trips did not justify the projects $1.2 billion cost. 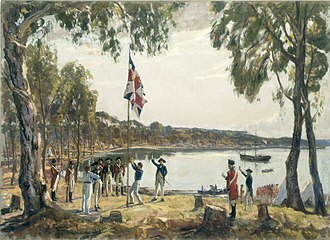 The government feared that the line would be under-utilised, much as the Airport Link has been, there had been community protest against the routing of the line through Parramatta Park. The Northern line is a London Underground line, coloured black on the Tube map. 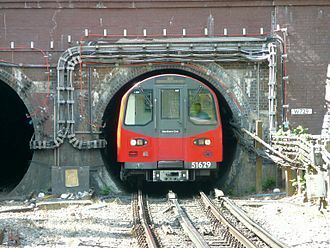 The section between Stockwell and Borough opened in 1890, and is the oldest section of deep-level tube line on the network, for most of its length it is a deep-level tube line. There were about 252,310,000 passenger journeys in 2011/12 on the Northern line, making it the second-busiest line on the Underground. Despite its name, it does not serve the northernmost stations on the network, though it does serve the southernmost station, there are 50 stations on the line, of which 36 have platforms below ground. An extension in the 1920s used a route planned by a fourth company. Abandoned plans from the 1920s to extend the line further southwards, from the 1930s to the 1970s, the tracks of a seventh company were managed as a branch of the Northern line. 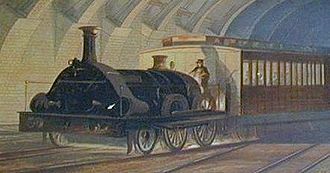 The C&SLR, Londons first deep-level tube railway, was built under the supervision of James Henry Greathead and it was the first of the Undergrounds lines to be constructed by boring deep below the surface and the first to be operated by electric traction. The railway opened in November 1890 from Stockwell to a station at King William Street. This was inconveniently placed and unable to cope with the traffic so, in 1900. By 1907 the C&SLR had been extended at both ends to run from Clapham Common to Euston. The CCE&HR was opened in 1907 and ran from Charing Cross via Euston and Camden Town to Golders Green and it was extended south by one stop to Embankment in 1914 to form an interchange with the Bakerloo and District lines. In 1913 the Underground Electric Railways Company of London, owner of the CCE&HR, took over the C&SLR, during the early 1920s, a series of works was carried out to connect the C&SLR and CCE&HR tunnels to enable an integrated service to be operated. The first of new tunnels, between the C&SLRs Euston station and the CCE&HRs station at Camden Town, had originally been planned in 1912 but had been delayed by World War I. 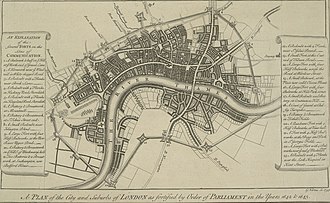 The second connection linked the CCE&HRs Embankment and C&SLRs Kennington stations and provided a new station at Waterloo to connect to the main line station there. A railroad switch, turnout or points is a mechanical installation enabling railway trains to be guided from one track to another, such as at a railway junction or where a spur or siding branches off. The switch consists of the pair of linked tapering rails, known as points and these points can be moved laterally into one of two positions to direct a train coming from the point blades toward the straight path or the diverging path. 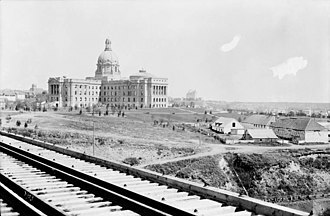 A train moving from the end toward the point blades is said to be executing a facing-point movement. Passage through a switch in this direction is known as a trailing-point movement, a switch generally has a straight through track and a diverging route. The handedness of the installation is described by the side that the track leaves. Right-hand switches have a path to the right of the straight track, when coming from the point blades. In many cases, such as yards, many switches can be found in a short section of track. Sometimes a switch merely divides one track into two, at others, it serves as a connection between two or more tracks, allowing a train to switch between them. A straight track is not always present, for example, both tracks may curve, one to the left and one to the right, or both tracks may curve, with differing radii, while still in the same direction. A railroad cars wheels are guided along the tracks by coning of the wheels, only in extreme cases does it rely on the flanges located on the insides of the wheels. When the wheels reach the switch, the wheels are guided along the route determined by which of the two points is connected to the track facing the switch. In the illustration, if the point is connected, the left wheel will be guided along the rail of that point. If the right point is connected, the right wheels flange will be guided along the rail of that point, and the train will continue along the straight track. Only one of the points may be connected to the track at any time. A mechanism is provided to move the points from one position to the other, this would require a lever to be moved by a human operator, and some switches are still controlled this way. However, most are now operated by a remotely controlled electric motor or by pneumatic or hydraulic actuation and this both allows for remote control and for stiffer, strong switches that would be too difficult to move by hand, yet allow for higher speeds. In a trailing-point movement, the flanges on the wheels will force the points to the proper position and this is sometimes known as running through the switch. Angel is a London Underground station in the Angel area of the London Borough of Islington. It is on the Bank branch of the Northern line, between Old Street and Kings Cross St. Pancras stations, in Travelcard Zone 1, the station was originally built by the City & South London Railway and opened on 17 November 1901. The station served as a terminus until the line was extended to Euston on 12 May 1907, the station was rebuilt in the early 1990s to accommodate the large number of passengers using the station. As a result, the station has a southbound platform, the longest escalators on the Underground network. It is a station on the Crossrail 2 proposed line. It is the nearest station to the campus of City University and Chapel Market, a London street market. Between Angel and Old Street is the disused City Road station, Angel station was originally built by the City & South London Railway, and opened on 17 November 1901 as the northern terminus of a new extension from Moorgate. The station building was designed by Sydney Smith and was on the corner of City Road, on 12 May 1907, the C&SLR opened a further extension from Angel to Euston and Angel became a through station. Access to the platforms from street level was via three Euston Anderson electric lifts before the rebuilding of the station. When the C&SLR line was closed for reconstruction in the early 1920s to accommodate larger trains, the station façade was reclad with tiling. For years since its opening, the station suffered from overcrowding and had a very narrow island platform. Consequently, the station was rebuilt in the early 1990s. Because of the distance between the new entrance and the platforms, and their depth, two flights of escalators were required, aligned approximately at a right angle, the stations ticket hall has a sculpture of an Angel by Kevin Boys. Angel is one of the number of stations to have only access to the platforms. With a vertical rise of 27 metres and a length of 60 metres, Angel station has the longest escalators on the Underground, the station was refurbished and work began on 2 January 2007. Additional CCTV cameras and Help Points were installed, bringing the total to 77 cameras in the station and 9 Help Points to better aid hearing-impaired passengers, in addition, new communications equipment was introduced and damaged signs were replaced with new ones. A railway platform is a section of pathway, alongside rail tracks at a railway station, metro station or tram stop, at which passengers may board or alight from trains or trams. Almost all rail stations have some form of platform, with larger stations having multiple platforms, the term platform has gained usage as a verb among some rail conductors, as in, The first two cars will not platform at. The term railway platform can mean any type of freight platform beside a rail siding for loading/unloading freight to/from rail cars. The most basic form of platform consists of an area at the level as the track. This would often not be considered a true platform, the more traditional platform is elevated relative to the track but often lower than the train floor, although ideally they should be at the same level. 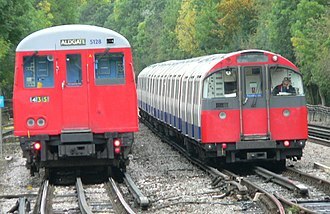 On the London Underground some stations are served by both District line and Piccadilly line trains, and the Piccadilly trains have lower floors. A tram stop is often in the middle of the street, usually it has as a platform a refuge area of a height to that of the sidewalk. The latter requires extra care by passengers and other traffic to avoid accidents, both types of tram stops can be seen in the tram networks of Melbourne and Toronto. A train station may be served by heavy-rail and light-rail vehicles with lower floors and have a dual- height platform, platform types include the bay platform, side platform, split platform and island platform. A bay platform is one at which the track terminates, i. e. a dead-end or siding, trains serving a bay platform must reverse in or out. A side platform is the usual type, alongside tracks where the train arrives from one end. An island platform has through platforms on both sides, it may be indented on one or both ends, with bay platforms, to reach an island platform there may be a bridge, a tunnel, or a level crossing. The climb up to the bridge or down to the tunnel may use stairs, escalators, lifts, or a combination of the above. Some, such as London Waterloo East, use instead of numbers, such as Paris-Gare de Lyon, use letters for one group of platforms. A Line 3 Scarborough car in its original livery leaving Lawrence East station; since 2015, Line 3 vehicles are covered in shrink wrap in Line 3's colour. Broad Street Subway train enters Fern Rock Transportation Center station. A Broad Street Subway express train arrives at City Hall Station. 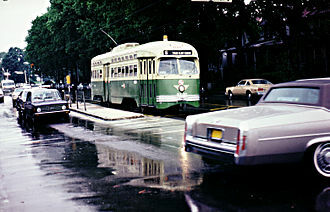 The former SEPTA Route 6 trolley during the early 1980s. The entrance/exit stairs for Mets-Willets Point station viewed from Citi Field. The Long Island Rail Road station is at rear left and the USTA National Tennis Center is at rear right. Marylebone station. 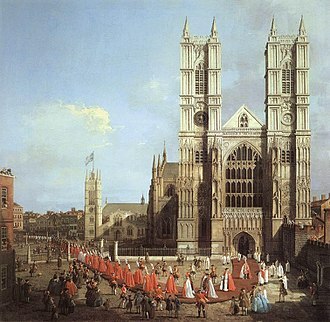 The London terminus of the Great Central Railway. The clearance between train and tunnel is often small. London Underground train at Hendon Central. Oscars on the shuttle service at Chatswood. Large stations may have hundreds of normal and double switches (Frankfurt am Main Central Station). Gas heating keeps a switch free from snow and ice. Aerial view of the viaduct across Woolloomooloo. The Eastern Suburbs line is shown in blue. Proposed extensions are shown as dotted lines. Unbuilt or uncompleted stations are shown in brackets. After Hurricane Sandy, the new South Ferry station was flooded and damaged, requiring the old station to reopen.